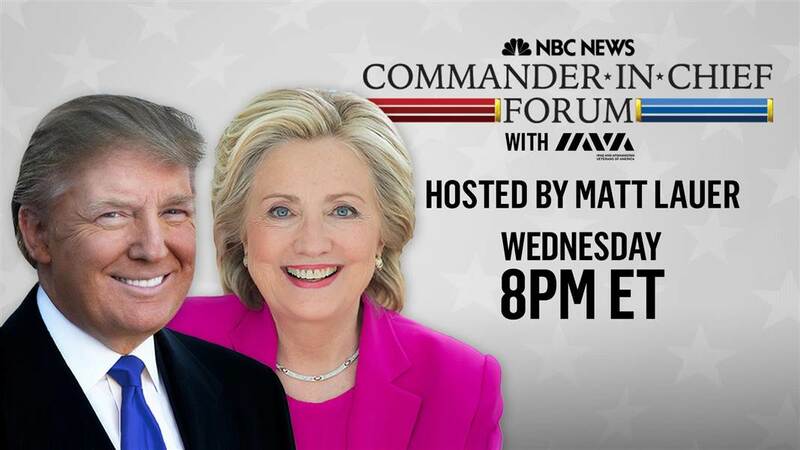 Wednesday night’s NBC Matt Lauer-moderated hour-long “forum” between presidential candidates Hillary Clinton and Donald Trump was unique in the annals of presidential debates: Each was asked one half-hour of questions by a moderator and audience without interacting with each other. That led to another uniqueness: the first network presidential debate ever that was weighted in favor of the Republican nominee. Moderator Lauer, first thing in the first half with Democratic nominee Clinton, stressed that she was not to use her time criticizing her opponent. She violated that confounding arbitrary rule and attacked Trump only twice. Trump’s interview was full of attacks on Clinton, which never stopped and were eventually ignored by Lauer. Why in the world would you disallow attacks on one’s opponent? They provide contrast, and part of any presidential debate, perhaps especially on military issues, is why one nominee’s positions are superior or inferior to one’s opponent’s. Speaking of substantive issues discussed: Hillary claimed that the word “Classified” was not used as a header, but it was her people who supplied the headers. Why did she not recognize “C” as meaning “Classified?” This was not discussed. Benghazi was not discussed. She articulated a terribly disappointing foreign policy philosophy, that force would be her last resort. She promised she would put no troops in Iraq. This means a continuation of making public military policy declarations irrespective of the military situation, as we have had in Iraq, not to mention her support of Obama in Syria, wherein he promised to act to stop and punish Syrian chemical campaigns, butnever did. No Democrats appear to be concerned about the fact that presidential weakness and unreliability leads to miscalculation and danger and that you cannot broadcast that you won’t act without encouraging your enemies. Donald Trump was asked about his “secret plan” to eliminate ISIS, reminiscent of Richard Nixon’s “secret plan” to end the Vietnam War. No, he doesn’t have a secret plan; this is simply rhetorical obfuscation. He maintained that disclosing plans to our enemies undercuts their effectiveness. Trump again maintained he opposed the Iraqi War from the start — no, he didn’t; he publicly supported the war, and then a year later began expressing doubts. The consistent claims by those — like Hillary and Trump — who now want to blame the Bush Administration for misleading them into the Iraq War ignores that fact that our evidence, Europe’s evidence, intelligence sources and every other believable source claimed honestly that they thought Iraq had weapons of mass destruction. Hillary and Trump were both asked what they were going to do about the 20+ suicides of ex-military every day. Both gave the pap answer of strengthening the mental health system. That is a classic punt. Say where that has ever made a macro difference. Good news for Hillary? She seemed lucid, absent post nasal drip and coughing, and wonkish. Trump came off better, partially because Clinton was disarmed from the start. As usual, he made no attempt at specifics. Two awful candidates, but debates don’t always reveal to what extent.